Featuring Julita Salmerón, Gustavo Salmerón, Antonio García Cabanes, Ramón García Salmerón, Paloma García Salmerón, David García Salmerón, Ignacio García Salmerón, Julia García Salmerón and archival footage of Juan Carlos de Borbón. Written by Gustavo Salmerón, Raúl de Torres and Beatriz Montañez. Distributed by Dogwoof. 91 minutes. Not Rated. There is a huge difference between a home movie and a documentary. Lots of people film their families – however it is rare that anyone outside of that family would really care to see that film. That knowledge is certainly not lost on Julita Salmerón, the subject of this film. Early on and often here she advises her son – Spanish actor Gustavo Salmerón, who has created this film from hundreds of hours of footage shot over about a decade – that no one who doesn’t know her will be interested in seeing a film about her. Thankfully, Gustavo recognized that his mother was wrong. Julita is a true character; smart, funny, eccentric, more than a little strange, an avid hoarder, but also a vibrant life force and a natural film presence. When she is on the screen, you can’t look at anyone else. The slightly oddball title is a listing of Julita’s fondest wishes as a little girl. She wanted to have lots of kids, a pet monkey, and to live in a castle. Of course, everyone has big dreams as a kid, but Julita (her given first name was Julia, but she changed it as a young woman because she wanted to stand out) actually achieved all of her goals. 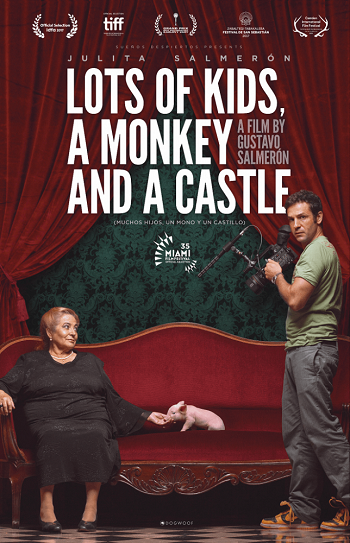 All of them are present and accounted for in this film: Julita’s large extended family, the cluttered castle that she and her husband worked so hard to buy from a relatively modest background, and even the monkey – though the monkey, who presumably died years ago, is relegated to a few short appearances in old photos, or archival home footage. The spine of the story – literally – is the somewhat odd look through the thousands of boxes in Julita’s castle to find a couple of pieces of vertebrae from the skeleton of her long-dead grandmother. The relative was murdered during the Spanish Civil War in the 1930s and the corpse was left on the shore to rot as a warning. For some reason that even she can’t quite explain, Julita decided to keep the bones as a memorial to her murdered ancestor, but somewhere along the line the body parts got swallowed up by all of the clutter in the home. Julita’s children, particularly Gustavo, become a little bit obsessive about finding the bones and giving them a proper burial. This – and a financial setback that forces Julita and her husband to sell the castle – leads to the entire family plunging into all the mess of boxes and drawers to look and prune through decades worth of old things. The family tries to get rid of lots of things, each of which Julita generally fights or frets over. However, there is a lot more to this than just an extended Spanish episode of Hoarders. No, Lots of Kids, A Monkey and a Castle is more intrigued in exploring the family dynamic, and particularly the life and intriguing worldview of this offbeat woman. We see her life played out in pictures and home movies, hear her passions and trivialities shared with equal conviction. Then as she ages and becomes infirm, it causes her to look inside and try to share her philosophy of life, even though she knows it is as unique as she is. It makes a personal connection. Julita reminded me a lot of my similarly larger-than-life late grandmother, and I have no doubt that most people have someone similarly dramatic who has been important in their lives. Julita was an imperfect woman, but she tried her best. In the end, her son Gustavo disproved her own presumption. Even though we don’t personally know her, this film about her life is endlessly fascinating. Tags: A Castle, A Monkey, Antonio García Cabanes, David García Salmerón, documentary, Gustavo Salmerón, hoarder, Ignacio García Salmerón, Juan Carlos de Borbón, Julia García Salmerón, Julita Salmerón, Lots of Kids, Lots of Kids A Monkey and a Castle, movie review, Paloma García Salmerón, PopEntertainment.com, Ramón García Salmerón, Spanish, Spanish Civil War. Bookmark the permalink.